As complement to the forged fittings, made in accordance with ASME B16.11, MECESA announces the addition to its range of fittings of the MECEPRIM SERIES, our intention being to increase the number of possibilities insofar as screwed end fittings produced from forgings or barstock are concerned. In some cases, we have decreased the wall thickness and, therefore, have indicated the maximum working pressure for each fitting as determined by ASME B31.1 standards. In forged or rolled for threading fittings, quality is guaranteed with a machining to the distinguished visually forged fittings CL. 2000 / 3000 / 6000 / 9000. Try to approach every time more excellence in the finishes of the threads. Our MECEWELD threaded fittings family has a wide variety of connections, dimensions, etc. They are made by forging, although you can also have a bar as raw material for your fabrications. CAD design of the screwed fittings for high temperatures and research in its constant improvement, both the finishes and properties. High quality. Special consideration in the finishes of the threads, thus obtaining a visual aspect more attractive than the forged accessories CL. 2000 / 3000 / 6000 / 9000. 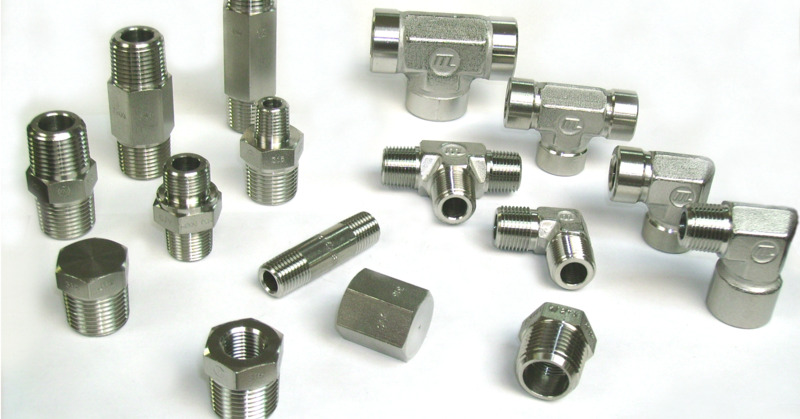 Threaded fittings in different materials: SS 316, SS 304, Hastelloy, Inconel, Carbon Steel, Brass, among others. Meceprim accessories were born in 1987, when the need to create a wide range of fittings to be replaced by the ASME B16.34 forgings, differentiated by excellent machining in the threads. Until today, they have been modifying designs and improving their properties, thus updating their technical and commercial documentation year after year. Stainless steel fittings are delivered pickled and passivated; and in carbon steel are subjected to a phosphate treatment and pickled brass. Connections are screwed and range between 1/8" through 1". Have been carefully designed so as to comply with the data given in this catalogue and with ASME B31.1 and ASME B31.3 standards; with manufacturing controlled so as to produce a high quality fitting. Screweld connections are either NPT according to ANSI/ASME B.1.20.1; BSPT per ISO 7 or BSP meeting DIN 3852-B. Following indications stated in the ASME B31.1 standard, all Meceprim accessories are marked, in accordance with MSS-SP25. Excellent machining of the thread in the connections guarantees a union and visual aspect of great quality. We have standard materials, dimensions and connection types, but we have other specials not cataloged, to facilitate the request of any modification of our standard product.